An audio visual installation in association with Schwartz Flavour Shots, an innovative new range of herb and spice blends locked in oil. What does flavour look like? How does it sound? These are the questions that inspired herb and spice experts, Schwartz, to create what they describe as a ‘Sonic Flavourscape'. Several tons of black peppercorns, cardamom, turmeric, paprika, cumin seeds, ginger, chilli and coriander were rigged to explode in perfect sync with a bespoke musical composition. 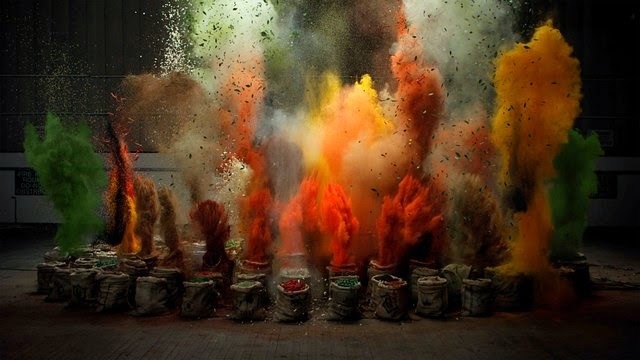 Each explosion represents an individual piano note or chord, which when filmed at high speed, creates a surreal three dimensional sound scape. The project bought together an eclectic collective of creative collaborators. DJ/Producer MJ Cole was approached to translate the sensation of taste into a musical composition. Film maker Chris Cairns and pyrotechnic designers, ‘Machine Shop’, then went to work turning this sound into a physical scale.